While you’ve likely followed some of the great tennis championships such as the US Open, Wimbledon, Australian Open and Davis Cup over the years, a new tournament has entered the picture: The Laver Cup. The Laver Cup is a partnership between TEAM8 (Roger Federer’s management company), Brazilian businessman and former Davis Cup player Jorge Paulo Lemann and Tennis Australia, named in honour of Australian tennis legend Rod Laver, one of the greatest players of all time. Last year’s inaugural event in Prague built momentum with fans as Team Europe competed against Team World (six members on each team). This year, Team World had the home advantage for three days of thrilling action at Chicago’s United Center (home of the Chicago Blackhawks), where I spent many hours getting my fangirl on watching Roger Federer, Nick Kyrgios, Novak Djokovic and other greats battle it out for the Laver Cup. Team spirit is the name of the game here rather than each man for himself. At court side, there’s a red seating area for Team World and a blue one for Team Europe. Circular couches invite informal chats between the players as they help cheer on the match at hand and occasionally offer on-the-spot coaching to players. Each team is led by a captain — Björn Borg for Team Europe and John McEnroe for Team World — with support from vice captains Thomas Enqvist (Team Europe) and Patrick McEnroe (Team World). Over three days, there are five sessions: two on Friday and Saturday and one on Sunday. Four matches are played daily: three singles and one doubles. Each match win is worth one point on Friday, two points on Saturday and three points on Sunday and the first team to reach 13 points wins the Cup. Both singles and doubles are best-of-three sets with ad scoring, with the third set decided by a 10-point tiebreak in the event of split sets. I was accredited to cover the event all week, which included being on hand for media conferences, official welcomes and watching world-class tennis. It was fun to see the city come to life during the player welcome on Wednesday at Pritzker Pavilion in Millennium Park. 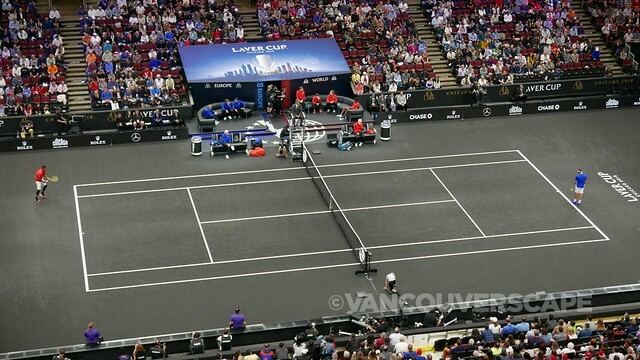 An official Laver Cup Fan Zone was open from Thursday through Sunday (free entry with online ticket registration) to get fans excited for the matches. 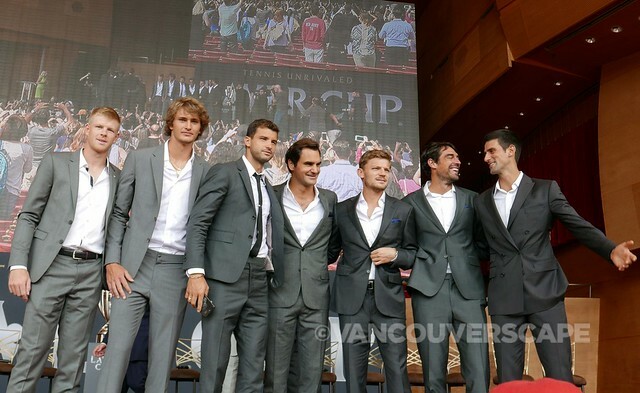 I attended the official player welcome amidst hundreds of tennis fans. Players were on hand to discuss what they found most exciting about the tournament. Team Captain Björn Borg stated, “Last year was unbelievable. This weekend will include some tight matches”. With his recent comeback, Novak Djokovic hopes to keep playing phenomenal tennis this week. “We’re excited about what we have to offer”, added John McEnroe. After the welcome event, players tossed tennis balls into the crowd as dozens rushed the stage with banners and Swiss flags to get closer to their idols and to grab a few selfies. Following the public welcome was a media event where journalists were invited to a Q&A session featuring a few key players from each team. When Novak was asked what makes this event so special, he replied that he was happy to see a new concept take shape, teaming up players that have rivalled one another for so many years. Björn believes that the Laver Cup will continue for many editions to come. I asked Roger Federer about his role in future Laver Cups, as he’s (somewhat) nearing retirement. He’s just excited to play for as long as he can. It just so happens that Switzerland was chosen for next year’s event, but as long as he can stay in the game, we’ll be cheering Roger on in Chicago, Geneva and who knows where else?! Match-ups were announced the day before play through exchange of line-up cards by each of the captains. The audience seemed in favour of Team World throughout most of the three-day competition. When Federer appeared in either a singles or doubles match, the crowd went wild, dividing the fans yet again. As team scoring tightened up significantly on the final day of matches, crowds continued to show their unwavering support for Team World. In the end though, Team Europe took the Cup with a final score of 13-8, their second victory in a row. Federer set up Europe’s victory by scoring three match points against John Isner on Sunday, leaving Alexander “Sascha” Zverev to clinch the winning point by defeating Kevin Anderson. Overall, this was a super fun event to watch unfold as the players began to warm up to the audience – and to one another – rather than worry about the next opponent they’d be playing. 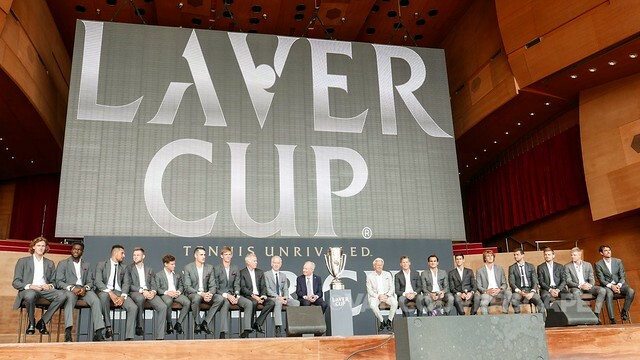 Laver Cup locations will rotate between major cities in Europe and the rest of the world; 2019’s tournament will be held in Geneva from September 20 to 22. This will give Roger Federer the pleasure of playing in the third edition of the Laver Cup in front of home country fans. Top image: Laver Cup 2018 opening ceremony at the United Center; photo by Ben Solomon/Laver Cup.